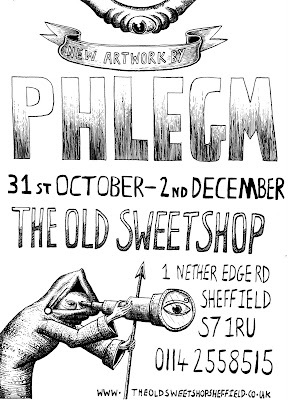 The work i had up in Ipswich last month will be going up for a month here in Sheffields old sweetshop in nether edge. Apart from a couple of new screen prints this is the only work I'll have for sale in a long time. I did some calculations to see how long the rest of my comics going to take to draw...At the rate I've been working...trying to be an illustrator/artist on the side it would take me a year. So last week i bought a calender, some highlighter pens and started a grueling sadist approach instead. If i stay stubborn, eat only beans, keep my house heated by log fires through the winter and watch rocky training montages before i sit down to draw each morning i think i can get it wrapped up some time next July. ps. Anyone in the world of facebook, which admittedly appears to be everyone but me, can join the old sweet shop group below. Click the links below for the gallery group and the exhibition event.